How does the updated adapter stack up? Back in 2015, Microsoft released a wireless USB adapter for Windows 10. This enabled PC gamers to use Microsoft’s Xbox One controllers on the platform since the controllers didn’t have Bluetooth builtin. It was functional and got the job done. But it was unsightly, it stuck out way too far and the build quality was terrible. We talked about that in our review here. Thankfully, Microsoft has released an updated wireless adapter for Windows 10, that does everything the original version did and does it better. Two years after Microsoft released the first Xbox Wireless Adapter for Windows 10, we now have an updated version. Thankfully, this new adapter does nearly everything the first adapter did. But it does it better. Smaller, 66% smaller according to Microsoft, this adapter can fit just about anywhere. The original one was a hassle to use, as it protruded too far out, which resulted in it not fitting in certain spaces. That or smacked by accident if it was on the front of your PC. This happened so many times on my PC, hence the tape and glue. I didn’t even want to use it on my laptop due to the length. With this new adapter, however, I didn’t experience any of the previous issues. It’s about the size of a USB Flash drive, and in some cases, smaller. The newer design comes with some changes. Where the sync button was locked on the side of the first adapter, making it hard to reach at times. Now it is located on the top of the adapter. You just pull it in and press the front of the adapter. A light that sits just below it will light up and that’s it. It would have liked to have the button light up instead, but is a minor grievance. The build quality, which is something I had a huge issue with, is immensely better. The original adapter had a flaw where if you applied to much pressure to the USB connector, it would bend and the casing would pull apart. Both of the two that I own have been super glued, with black tape around them. With this new adapter, all that is a thing of the past. The build quality is so much better. It feels like a quality product now. I’m sure many will wonder why Microsoft even bothered with this. Especially since their newer controllers are Bluetooth-capable. The answer would be that there are still many controllers without that ability in the wild. Including the very expensive (and possibly getting an update) Xbox One Elite controller. I’m sure not many people are going to want to part with that controller or any special edition controllers they already own. I’ve also found that using Bluetooth is spotty, as the connection sometimes drops. Not so much with this adapter. I’m also happy to report that I haven’t had any issues with driver support. This was a huge issue before, with many people experiencing issues such as their controllers going to sleep and not waking up with a connection. Or with Valve’s Steam running into issues. Not so much this time around. My experience has been rock solid, with zero issues. However, if you install the adapter and it shows up as “Xbox Acc”, you’ll have to force a new update. There’s a new driver, that once installed will label the device as Xbox Wireless Adapter for Windows #2. At this time, you can’t download the driver via the Microsoft website. Or at the very least, I didn’t see it. It supports up to eight controllers plus headsets (up to four Xbox One Chat Headsets or two Xbox One Stereo Headsets. Just as the original adapter did. The downside is that the new adapter is strictly for Windows 10. Meaning that if you’re still running Windows 7/8/8.1 and own the original adapter, but want to upgrade, you won’t be able to. Not unless you upgrade your OS first. This was also the case two years ago until enough people complained about it. Though I don’t expect them to back down this time, as they’re trying to push Windows 10. All in all, this is a fantastic upgrade over original Xbox Wireless adapter. Before I could only recommend the original adapter if you really needed one, or wanted to move away from the Xbox 360 adapter. In light of this updated version, that’s all changed. If you want to play on your Windows 10 PC, laptop or even tablet with an Xbox One controller. Then you should definitely get this new version. At the time of this review, you should be able to find these in most stores. Kudos to Microsoft for listening to the feedback and producing a vastly superior product this time around. Review Disclosure Statement: Microsoft’s Xbox Wireless Adapter for Windows 10 was purchased for review purposes. For more information on how we review video games and other media/technology, please go review our Review Guideline/Scoring Policy for more info. 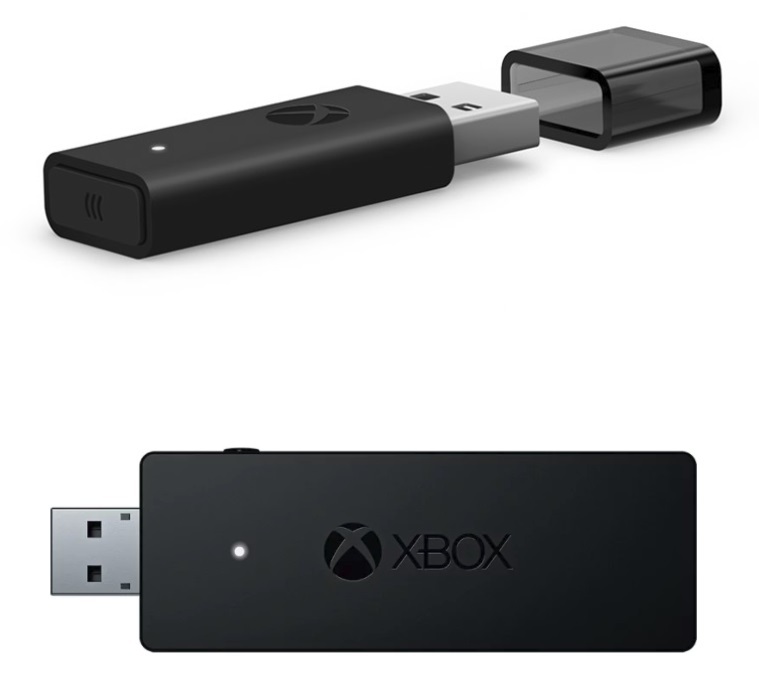 Microsoft’s second attempt of their Xbox Wireless Adapter for Windows 10 is a complete 180 when compared to the original adapter. Better build quality, a smaller format, better button placement and a slicker look. Highly recommended if you want to use an Xbox One controller on your PC, laptop or tablet, but without a cable.